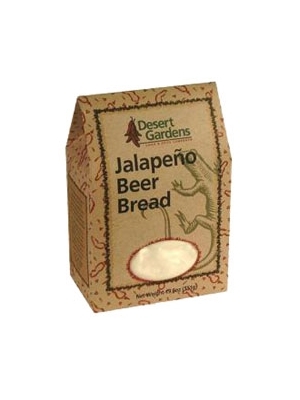 Just add 12 oz of your favorite beer to Desert Gardens Jalapeno Beer Bread mix! In less than one hour's time you'll have a perfect golden loaf of Southwestern spiced up bread - fabulous served with any of Desert Garden's soups! Place contents in bowl and mix together DO NOT OVER MIX. Pour into a greased 9x5 bread loaf pan. Bake for 50 - 55 minutes or until loaf is golden brown and pulls away from pan. Use dough as pizza crust or bread sticks. Enriched Unbleached Flour (Wheat Flour, Enzyme, Ascorbic Acid, Niacin, Reduced Iron, Thiamin Mononitrate, Riboflavin, Folate), Sugar, Red and Green Bell Peppers, Jalapeno Peppers, Leavening (Sodium Acid Pyrophosphate, Sodium Bicarbonate), Salt.